If you have been looking for a crunchy, savory, addictive and healthy snack, you’re in the right place. 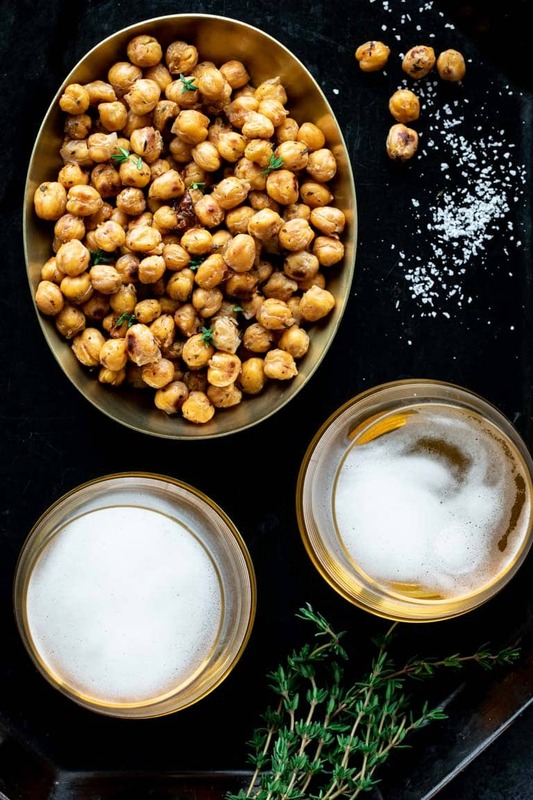 These Crispy Roasted Chickpeas will rock your world. 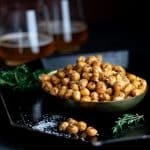 With only five ingredients these crunchy garbanzo beans are ready in just 25 minutes and come in at just 128 calories per serving! They would be a perfect addition to your Superbowl celebration, too! 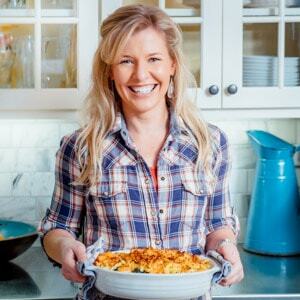 ~ It’s Stephanie here with a new cookbook review! I found this gem of a baked chickpeas recipe in The 30-Minute Mediterranean Diet Cookbook. It’s written by two dietitians, Serena Ball and Deanna Segrave. Their love of food coupled with their nutritional knowledge shines through on their blog Teaspoon of Spice. The Mediterranean Diet has always spoken to me. I’m very much an (almost) anything in moderation kind of girl. I love food and luckily for me most of it seems to love me. The heart healthy Mediterranean Diet focuses on plenty of vegetables and fruits, whole grains, seafood, healthy fats like olive oil and wine. Yes, you heard me right. Wine in moderation is allowed. And as long as I’m stocking up on my veggies and fish I can also enjoy a little whole grain bread dipped in a bit of extra-virgin olive oil with that occasional glass ‘o wine. Sign me up! For a more visual explanation check out the Mediterranean Diet Food Pyramid created 25 years ago by Oldways, a nonprofit food and nutrition organization. This cookbook is full of super flavorful Mediterranean inspired recipes that are ready in 30 minutes or less. If you have a special dietary restriction, there are several nut-free, dairy-free, gluten-free, egg-free, vegetarian and vegan options. All of the recipes are accessible and simple. In the beginning of the book Serena and Deanna explain the multitude of health benefits of the Mediterranean Diet including reduced risk of arthritis, Alzheimers, diabetes, cancer and asthma. 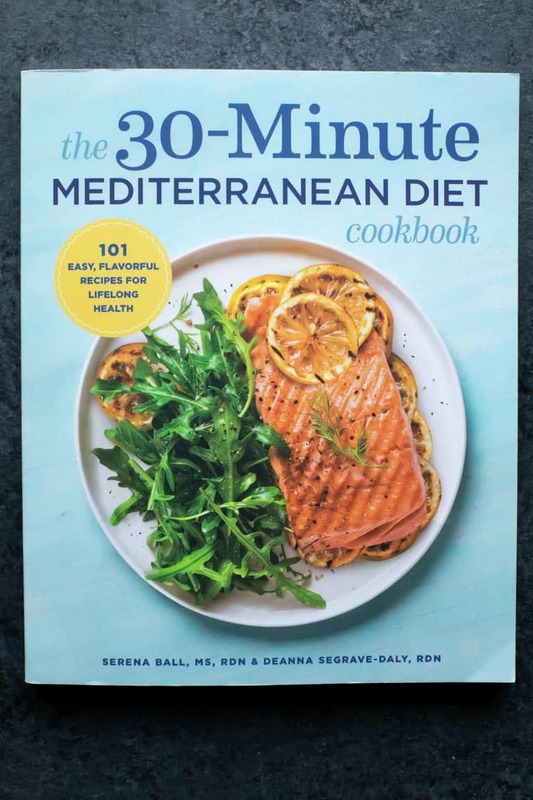 From breakfast, to pizza and pasta, to fish and seafood, to dessert the 30-Minute Mediterranean Diet Cookbook is a book for everyone. I always say that I would step on a cupcake to get to a bowl of pita chips. When I have a craving it’s not for something sweet, but something salty, tangy and crunchy like garlic almond kale chips. Boy did I hit the jackpot with this baked chickpeas recipe. And considering they are gluten-free, nut-free, diary-free and vegan they are a perfect roasted chickpeas snack! In addition to olive oil and salt this version has fresh thyme and orange zest. It is the perfect flavor combination to capitalize on the crunchy on the outside, but creamy on the inside quality of the chickpeas. The thyme and salt add a great savory note, while the orange zest adds a subtle zing of freshness. You may want to make a double batch! Dry those chickpeas. In order to get them crispy on the outside they need to be dry. You don’t want mushy steamed chickpeas do you? Oil up those chickpeas. It doesn’t take much, just 2 teaspoons of extra virgin olive oil for a 15 ounce can. But the combination of the oil and contact with the baking sheet will result in uber-crunchy chickpeas. Heat is your friend. Baking them at a high heat (450 degrees) really creates that crispy exterior and keeps the creamy inside texture. The key is to watch them closely and shake the pan occasionally to make sure they don’t burn. If you have an oven that runs hot, you may want to consider lowering the heat to 400 or 425 degrees and possibly roasting them for a bit longer if needed. Get creative with the flavors. Mixing up the flavor combinations like cumin and lime zest or curry powder and ground ginger will keep the awesome snack from getting boring. I can’t wait to try Serena’s favorite combo of unsweetened cocoa powder and smoked paprika. Whoa! So open up that spice cabinet and get a little crazy! 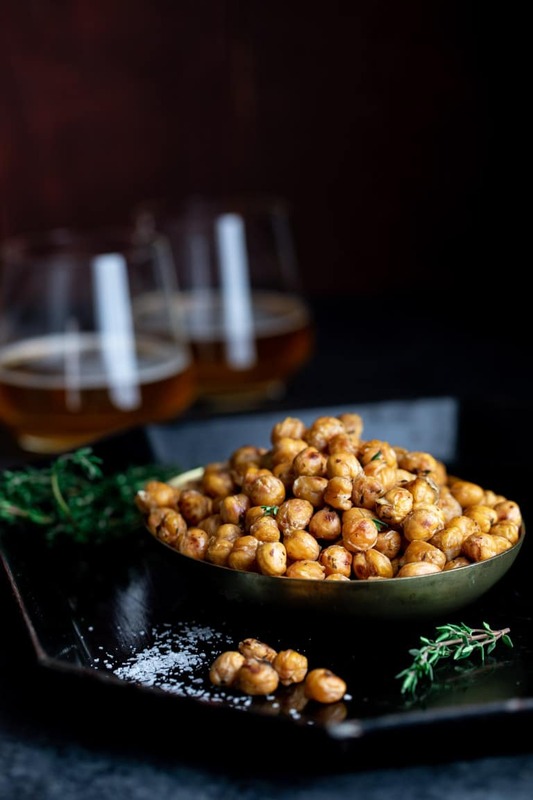 This roasted chickpeas snack is best eaten the day it is made. Inevitably no matter how you store them they will not be as crispy the next day. That is not to say they aren’t still super tasty and you can re-crisp them in the oven if you wanted to. Just remember that moisture is the enemy of these oven roasted chickpeas. Store them in plastic bags or containers. Put them in the refrigerator, as long as they are crispy and mostly dry they can be stored at room temperature for a couple of days. Store them in a glass container with the lid slightly ajar. Even better would be to store them in a parchment or paper bag or in a bowl covered with a paper towel. These storage options allow air to circulate around them and keep them drier and crispier. I can’t wait to make a few of the other amazing-sounding recipes in this awesome cookbook like Roasted Broccoli Panzanella Salad, Tuscan Tuna and Zucchini Burgers and Yogurt and Herb Marinated Pork Tenderloin. So if you’re looking for me I’ll be sitting and flipping through this lovely cookbook with my glass of wine, a handful of crispy roasted chickpeas and dreaming of being in an exotic locale somewhere on the Mediterranean Sea. 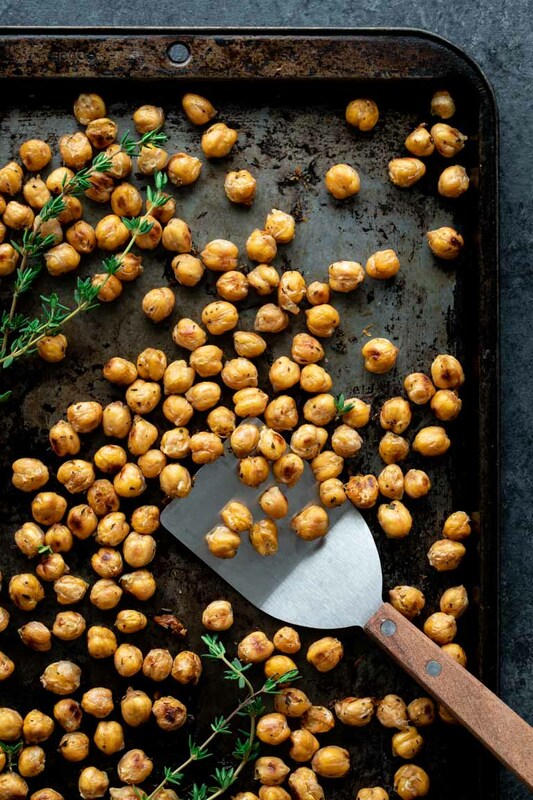 These Crispy Roasted Chickpeas will rock your world. 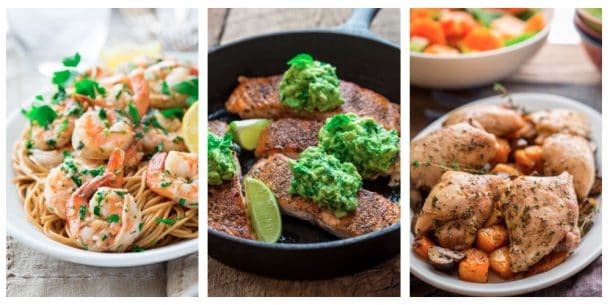 With only five ingredients these little babies are ready in just 25 minutes and come in at just 128 calories per serving! Bonus that they are gluten free, nut free, diary free and vegan, too! Spread the chickpeas on a clean kitchen towel, and rub gently until dry. Spread the chickpeas on a large, rimmed baking sheet. Drizzle with the oil and sprinkle with the thyme and salt. Using a microplane or citrus zester, zest half of the orange over the chickpeas. Mix well using your hands. Bake for 10 minutes, then give the baking sheet a quick shake. (Do not remove the baking sheet from the oven). Bake for 10 minutes more. Taste the chickpeas (carefully). If they are golden, but need to be crispier, bake for 3 minutes more. Change up the flavor combination of this fun snack. Try 1/4 teaspoon each of cumin and lime zest or try 1/4 teaspoon each of curry powder and ginger. Serena’s favorite combo is 1/4 teaspoon each of unsweetened cocoa power and smoked paprika. Ooooh, I don’t think I’ve ever tried chickpeas like this. I LOVE the orange zest and thyme… that’s gotta taste fantastic together! I’ve always naturally eaten a diet pretty close to the Mediterranean diet — I love it. And this healthy snack is calling my name! Such delicious flavors and beautiful photos! So excited to make these for the first time! I have tons of chickpeas I want to use. I will be quickly addicted to this savory little snack! What a fun snack idea! Love the pictures.